As a fan of Russian cinema, I took a chance on the 2010 film Iron Lord (Yaroslav, Tysyachu let Nazad) from director Dmitri Korobkin. Apart from a short youtube clip, I had no way of gauging whether or not the DVD was worth the purchase, and it’s not available, at least at the time of this post, for rent. 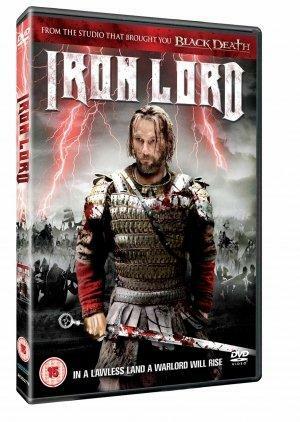 These low budget historical/adventure films often end up cheesy, but I was surprised to find that Iron Lord was an entertaining film–not too heavy on gore– despite its historical and war-like setting. The film begins with a rapid explanation which sets its story in its historical context. It’s the beginning of the 11th century. Grand Prince Vladimir rules in Kiev, and it’s been two decades since he brought Christianity to Russia. His sons rule different areas of the land, and collect tribute from their respective regions–some of which is sent to Kiev. Vladimir’s youngest son Yaroslav (Alexsandr Ivashkevich), oversees the most eastern section and rules in Rostov. There’s a problem collecting tributes, however, mainly due to the intervention of brigands who also harvest slaves from the local tribes. When the film begins, Yaroslav sets out to collect his tribute only to run right into a band of brigands and their latest haul as they head along the Volga trade route. Yaroslav and his men, including the mercenary Berserker viking, Harald (Aleksey Kravchenko) take a stand against the brigands which results in the decimation of a pagan shrine of the Bear tribe. Following the attack, Yaroslav reasons that the region will not be safe unless he builds a fort there and offers protection to the local tribes–you can’t after all expect regular tribute payments if those who owe it are being hauled off into slavery. As Yaroslav and his men continue their journey, they capture a woman, Raida (Svetlana Chuikina), the daughter of the chief of the Bear tribe, Yaroslav decide to return her to her village…. Meanwhile back in Rostov, Prince Sviatozar (Viktor Verzhbitskiy) waits for Yaroslav to return to marry his daughter, Princess Zhelanna, but with each increasing success of the brigands, he begins to suspect that there’s a traitor in their midst…. Skullduggery, battles and even a couple of romances vie for screen time in a film which has very little down time. In spite of the fact the warriors use axes, swords, bows and arrows, and various other pieces of crude weaponry, there’s surprisingly little gore, and the few torture scenes are not overdone–perhaps this is due to the fact that everything is very basic. No iron maidens here–although there is a one mention of a rack, but torture is relegated mostly off-screen. In one torture scene, one poor devil is tortured with a stone removed from the fire, while outside children play with stones, halting their game to listen to the screams. Scenes show life in Rostov and also in the Bear pagan village which is a nest of traps, underground tunnels, and an enormous grizzly bear who is the manifestaion of their god, Veles. The director seems to use a low-budget handicap to good results. Consequently he succeeds in conveying the crude realism and casual violence of the times; I was ambushed by a couple of the plot developments, and that’s always a good thing. It isn’t particularly easy to identify the different camps (brigands, the Varangian army, etc) as a title announcing the location of a scene comes on the screen in Russian, so it’s important to keep on your toes for this one, or you’ll miss some of the action. The DVD cover states that this adventure tale is based on a true story, and it is true that Prince Yaroslav united Russia and established the town of Yaroslavl on the Volga. I think I’d like to watch this one. There are a few similar Russian movies out there at the moment and European ones as well. The best I’ve seen so far is probably Arn Knighttemplar. I actually wanted to buy this and bought Ironclad instead. Not exactly the same and way too gory. Did you watch Valhalla Rising? I found it oddly fascinating. No I haven’t seen it yet, and I tend to watch Viking films if I can find one.